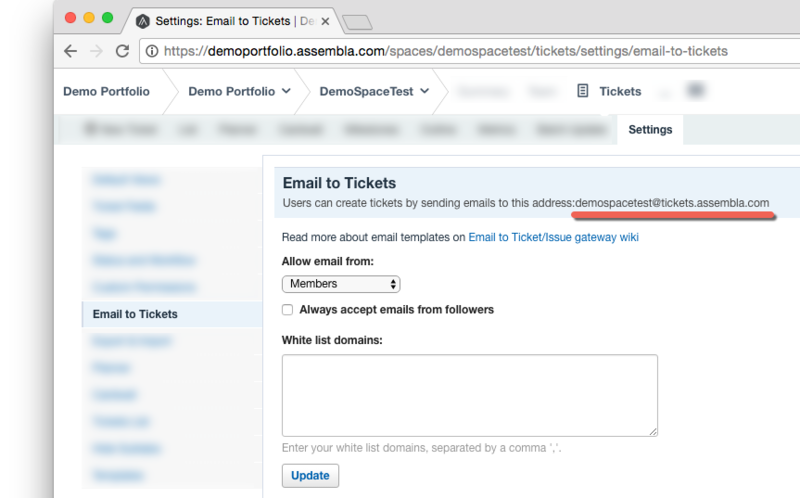 If you would like to control who to allow emails from, you can easily do so by going to your Space’s Tickets tab > Settings > Email to Tickets. By default, only ‘Members’ of the space can send emails. Note: When attaching a file to an email to add to either a new or existing ticket, a 15Mb limit exists on files attached per email. To create a new ticket, you can send an email to <space-url-name>@tickets.assembla.com. You can find your Space-specific email at Tickets > Settings > Email to Tickets. A single dot on a line after the 'Description:' indicator will mark an end. This ensures that any subsequent text in the ticket description is not included, such as an email signature. The same applies to the Comment field when editing a ticket. Send an email to "<space-url-name>+<ticket-number>@tickets.assembla.com". Reminder: Don't forget to add a single dot at the end of your email to ensure subsequent texts (like email signatures) are not included. You can edit existing tickets using emails in the same two ways mentioned in the 'Add comments to a ticket using emails' section. Send an email to "<space-url-name>+<ticket-number>@tickets.assembla.com" with ticket fields and corresponding ticket values that you would like to update. Ticket status changed to "Duplicado"